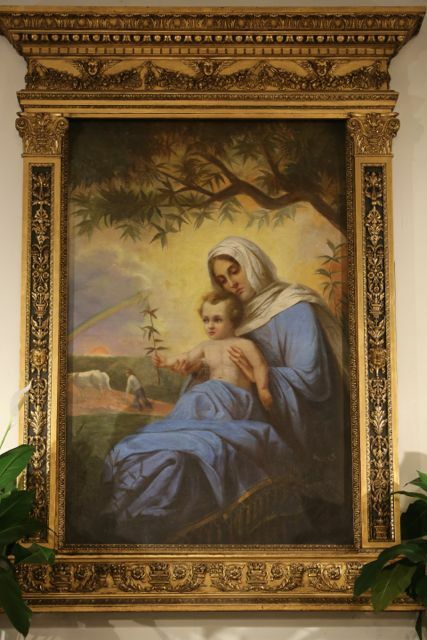 Another prime target of “Making all Things New” is Our Lady of Peace. 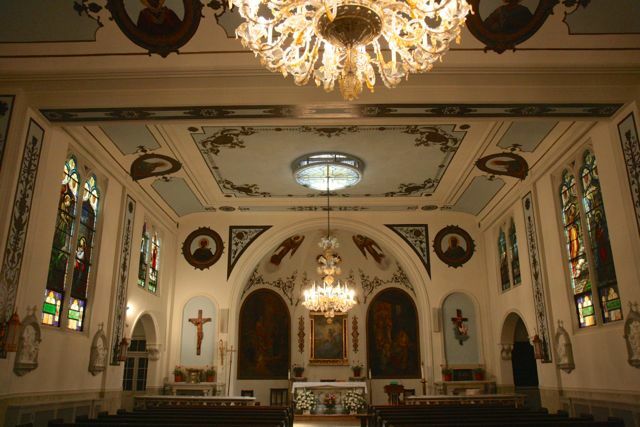 It was originally an Italian ethnic parish – a former protestant church that became one of the most extravagantly decorated Catholic sanctuaries in the city. It gradually grew into a “regular” if small parish of the Archdiocese in an area that had become very affluent indeed. 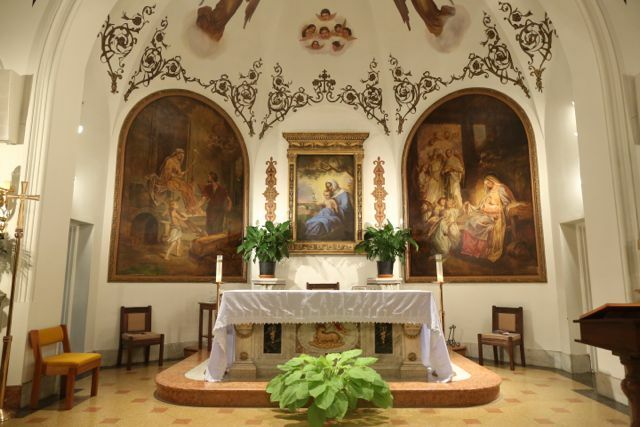 But all the art in this church was created in the Italian, pre-Conciliar days. 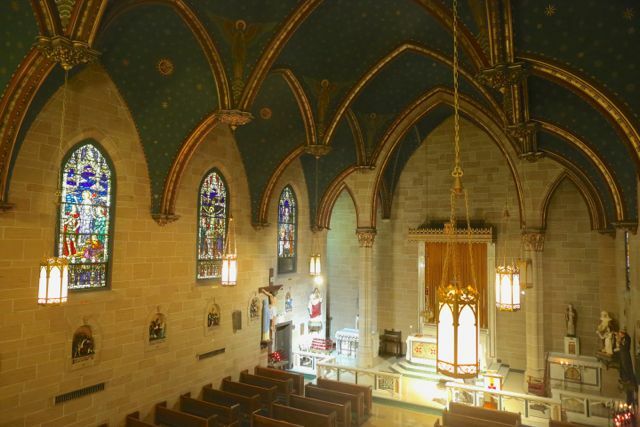 Like several other small parishes in well-to-do areas( St. Elizabeth of Hungary, St. John the Martyr and – unsuccessfully for the time being – St. Thomas More) the closing of this parish undoubtedly appeared as a real opportunity to the Archdiocese! Needless to say the parishioners of Our Lady of Peace did not at all agree with his action which erases their small but successful parish. The resistance has been spirited. 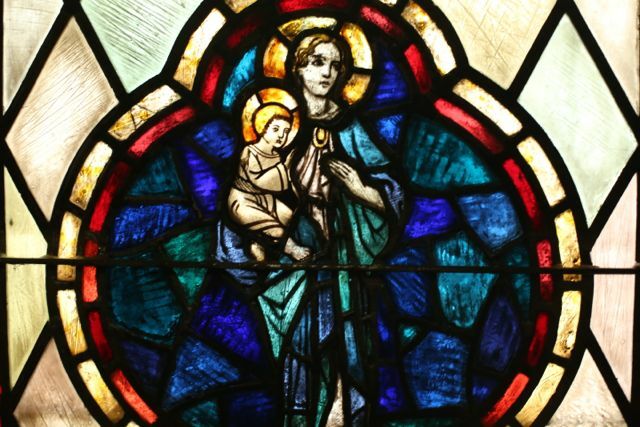 Like the parishioners of St. Elizabeth of Hungary, they have lodged an appeal with Vatican; the Archdiocese has curtly informed them that this will not delay the scheduled closing on August 1. (Above and Below) Unfortunately the sanctuary has suffered severe damage in the wake of the Council. But much of the originally elaborate furnishings survives – like the ornate communion rail. 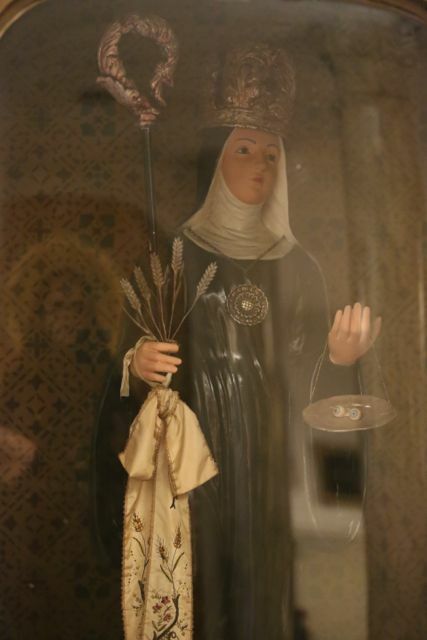 (Above) Santa Fara – a local Sicilian favorite – in her glass case. (Above) A recent mass. In this austere but dignified liturgy the topic of the imminent closing was not mentioned. But all the more vehement were the reactions and discussions of the parishioners after the mass! Needless to say no one was arguing for the Archdiocesan plan. 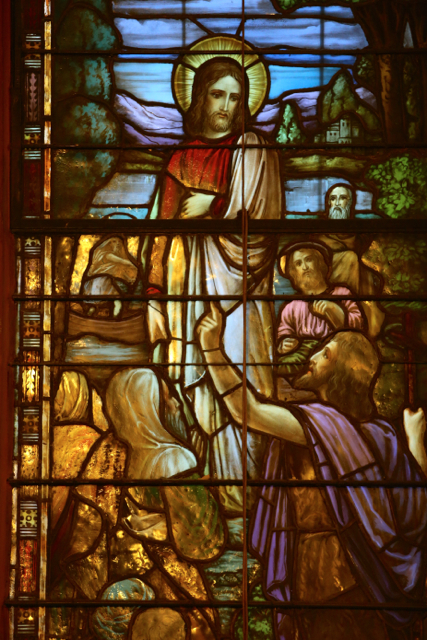 The Churches of New York LXXIII: For when a Church dies…. How many things are lost when a church closes! 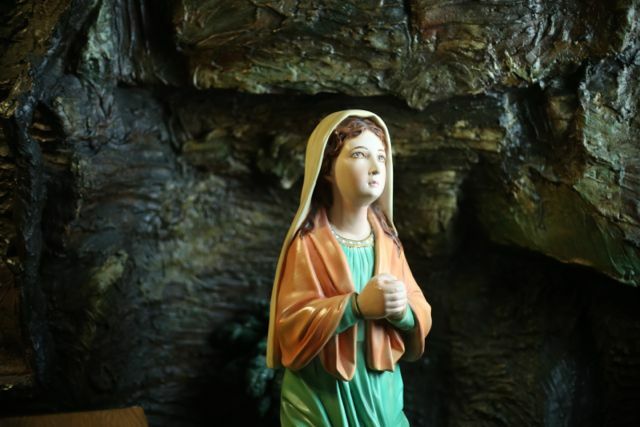 Catholics and non-Catholics alike lose the presence of a familiar landmark, anchoring the streetscape. The small church of St Elizabeth of Hungary presides over a tree-lined block of quaint buildings, which has miraculously survived intact to this day. Whereas elsewhere the inhumanly scaled towers of the financial and legal empires and the equally monstrous high-rises of the superrich increasingly dominate, here the tower of a small church still presides over walkups and modest storefronts. Above the façade rises a tower of unfamiliar form, mimicking those of the “Old country” like the Teyn church in Prague. It’s a church which is both part of the streetscape yet soars above it. 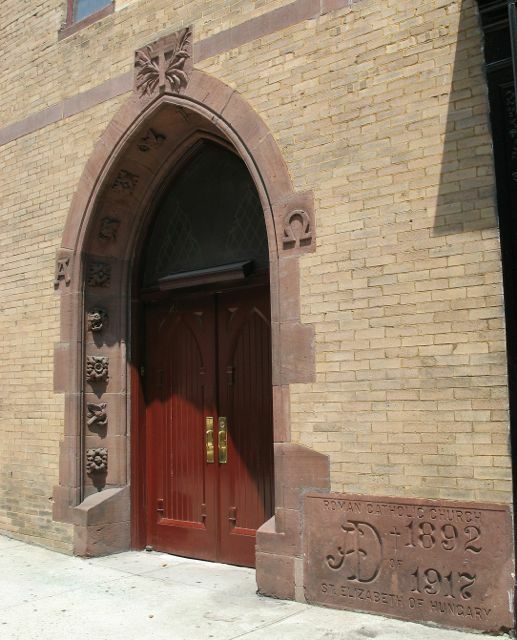 St. Elizabeth’s assumes a guiding role in this block’s appearance while modestly remaining part of the community. 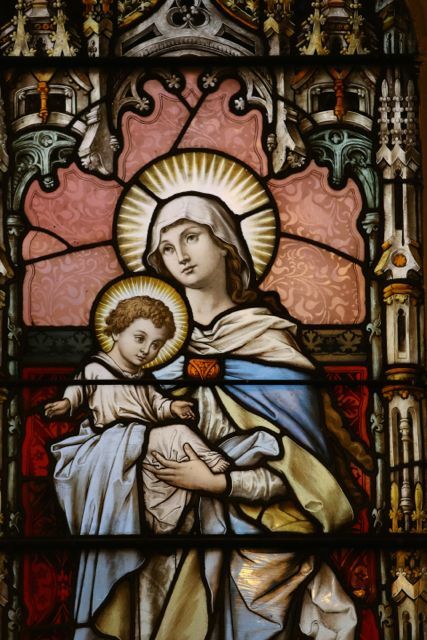 When a church dies a thousand memories disappear which link the rootless post -conciliar Catholics of today to the sacrifices of prior generations. 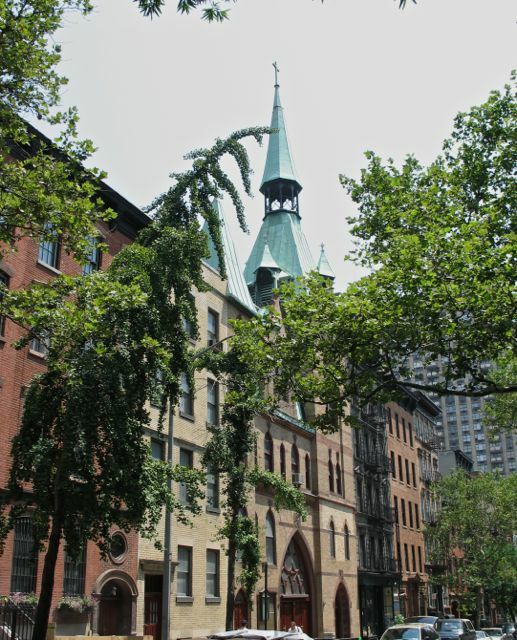 Slovak immigrants – never as significant a force in New York as elsewhere in the US – organized St. Elizabeth as their first church in 1892 on the Lower East Side. That building still stands, and some of the furnishings in St. Elizabeth undoubtedly come from that church. 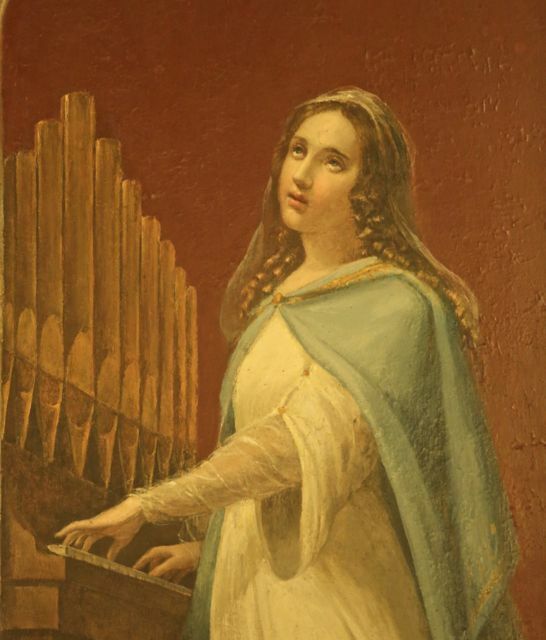 Now Archbishop Corrigan of New York rejected the first suggested patron for the new parish (St. John the Baptist), and ordered it to named instead for St. Elizabeth of Hungary. 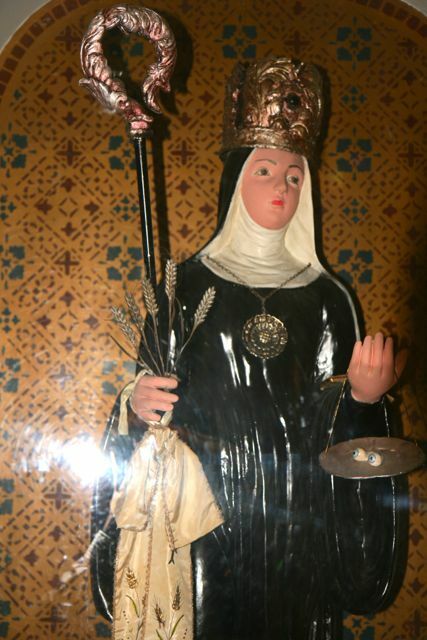 As he rather insensitively put it, “as St Elizabeth was one of your national saints, you ought to be very glad to be placed under her invocation.” (Slovakia was part of Hungary for a thousand years) 1) And then in 1917 the parish moved to Yorkville and took over and redesigned a Protestant church. After that, if one flips through the parish history, things settle down to the routine of parish life: meetings and banquets of the innumerable organizations that filled the calendar even of a small parish back then; fundraisers; the archepiscopal visits of Cooke, O’Connor etc. Beginning in the 1950’s rising rents gradually displaced the Slovak population. 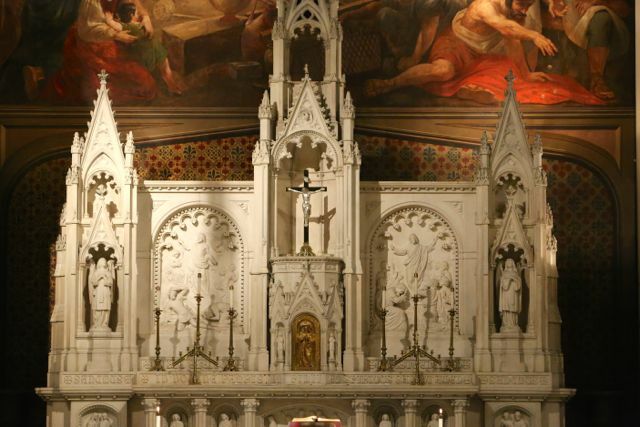 A more generic Catholic middle class – including many Irish – filled the church in what was steadily becoming a more affluent area. 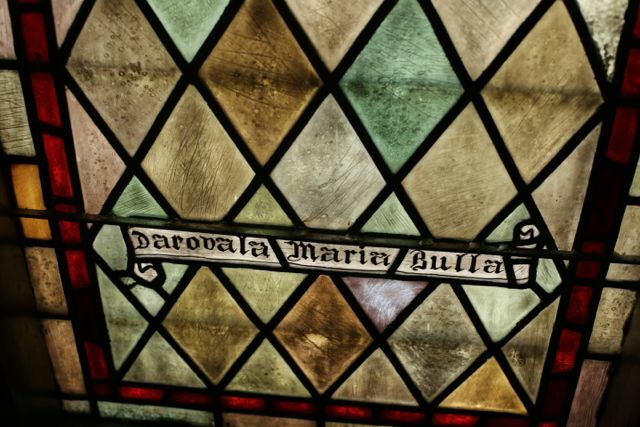 By 2000 some parishioners were not totally clear what was the language found on inscriptions all over the church – was it Polish? That problem will disappear – when this church dies the Slovak commemorations on the windows as well as the plaques of donors in more recent fundraising efforts likewise vanish. And finally came the New York Catholic deaf community. 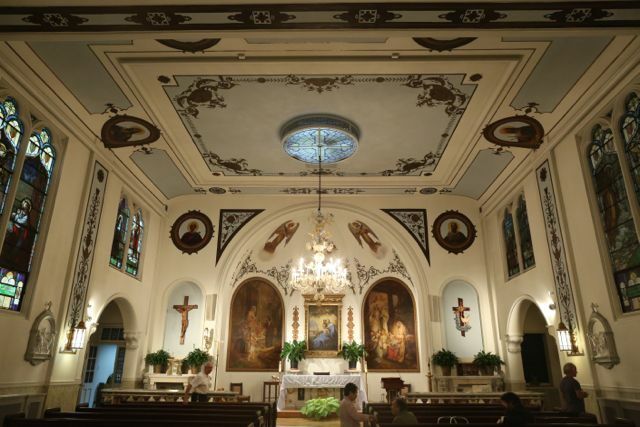 For them St. Elizabeth was ideal for this apostolate – a small intimate space, where the signing could be easily seen. And, after all, a church for the deaf is even more important in the Novus Ordo rite than it would be in a Traditional community! Cardinal Cooke celebrated a mass for the deaf here in 1983. 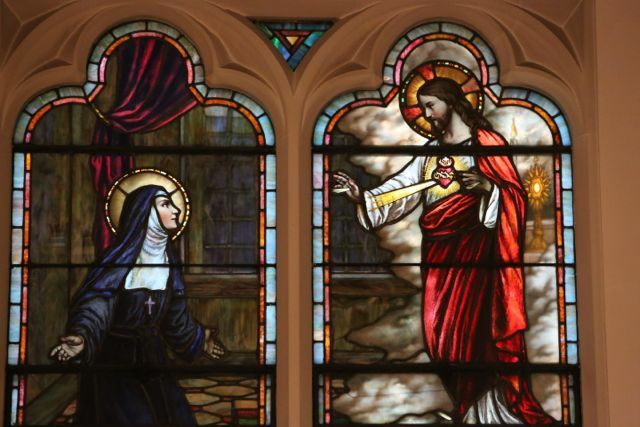 And so St. Elizabeth continued on, sharing the vicissitudes of the city and the neighborhood. Can we not forget how fourteen years ago, across the street from the church, candles flickered at night around a hastily improvised memorial to a local victim of 9/11? 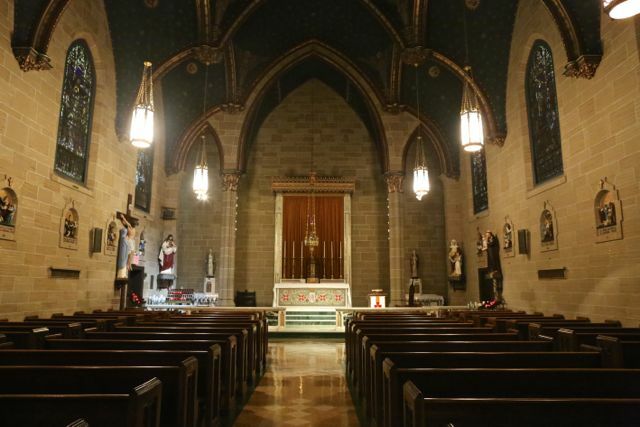 But what will also be lost when St Elizabeth closes is not just a historical monument, but also an existing refuge of beauty and quiet in New York. Inside this church, the Slovaks in plaster created the appearance of a late gothic sanctuary out of hewn stone. The interior is admittedly just one large simple space. The statues are largely of plaster. 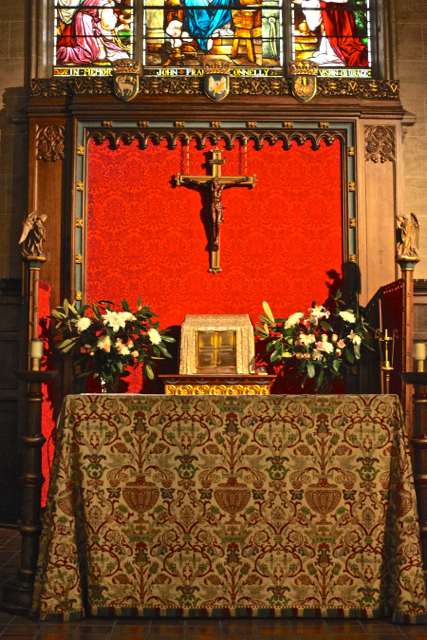 I also concede that some of the 1950’s “Liturgical Movement” altars are mediocre. But if modest, all the decor and furnishings are tasteful and finely executed – the metalwork, the statues, the windows, the blue of the ceiling studded with gold stars. Rarely has so much been accomplished in a church with such little resources! It is quintessentially Catholic. 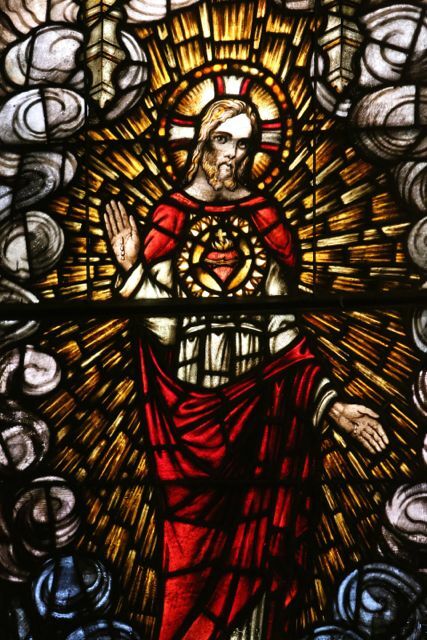 There is hardly any other Catholic Church that so lends itself to meditation, especially when the lights are extinguished and the only illumination is the stained glass windows and the many (real)votive candles. The din of the city does not intrude into this space. Yes, when a church dies so much that is unique, beautiful, precious and rare disappears! The great emperor Charles V said when he saw the new church that the canons of Cordoba cathedral had erected for themselves inside the old cathedral (a former mosque): “they have taken something unique in all the world and destroyed it to build something you can find in any city.” And yet in that case Christian worship continued! 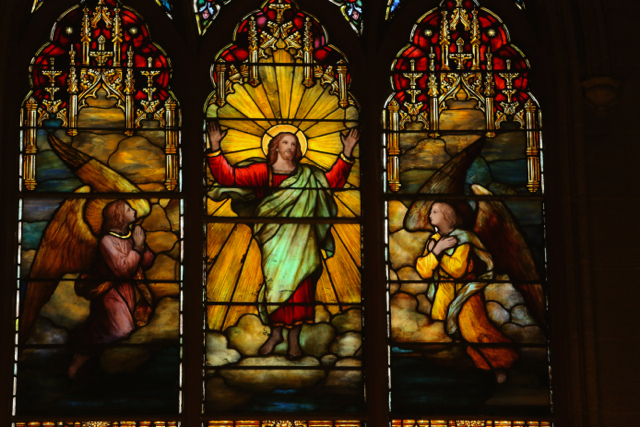 For what happens when a church dies is, above all, the loss of one more space consecrated to God. One more visual proof is offered (or so it would seem to the “man in the street”) that the forces of organized unbelief are prevailing, that the Christian Church is continuing its retreat toward oblivion. And what is obtained in return? A few million dollars that will be powdered away in the blink of an eye? A new set of luxury condos? A heritage of bitterness among the parishioners? 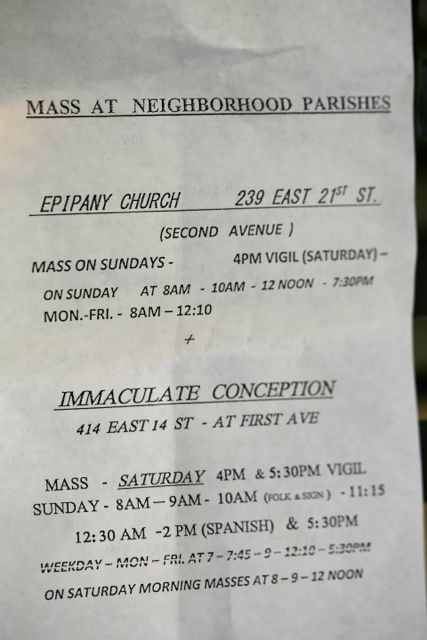 Finally, do we need to point out the contrast between what is happening at St.Elizabeth’s to one of the most “marginal” communities in New York and what is being trumpeted nowadays by the Vatican? For a full description and video see HERE. 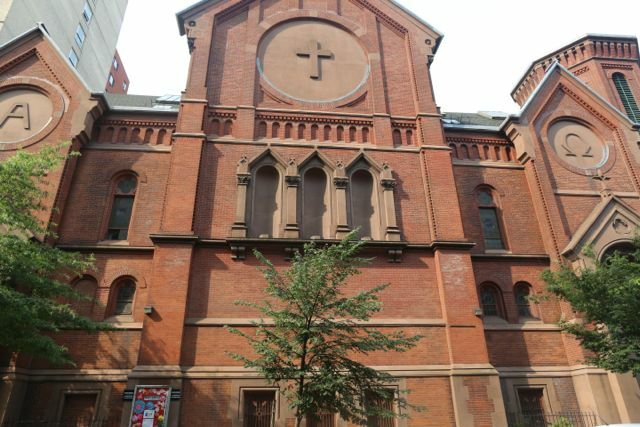 (Above) The armory-like second facade of St. Stephen’s church on East 29th Street. 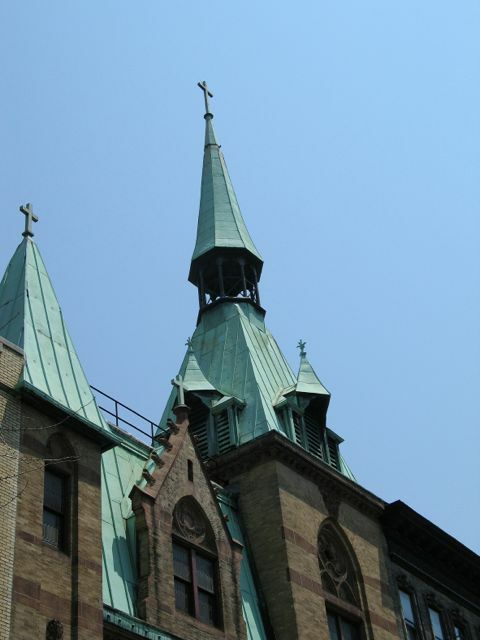 When I commenced this review of the Catholic churches in Manhattan I did have in the back of my mind that I might be documenting a rapidly disappearing past. Now August 1, the implementation date of “Making all Things New” is fast approaching. Let’s go to the front lines of “MATN” to see what is happening in those parishes either closing or threated with closure. 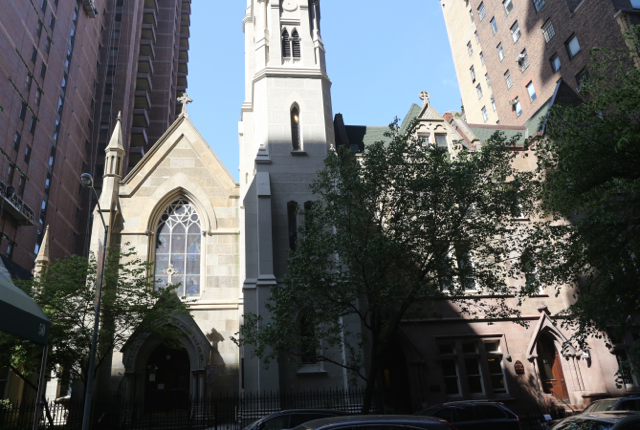 Of all these churches there is none that exceeds the historic and artistic significance of St. Stephen’s on East 28th street. 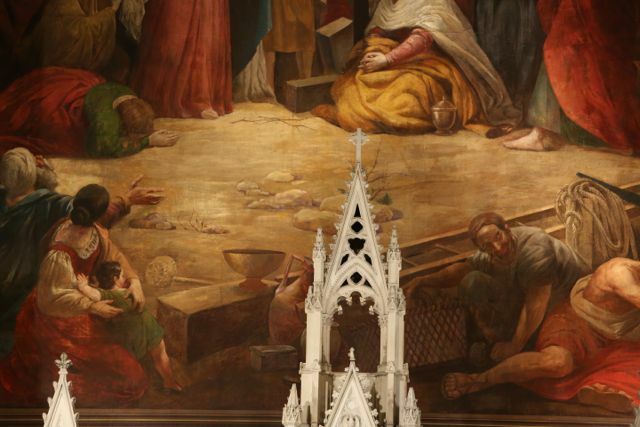 The grandiose church of St. Stephen’s in the 19th century was one of the greatest parishes of New York, with a congregation of twenty-five thousand. In this church you can still sense the legacy of its great pastors. Jeremiah Cummings, noted writer and first pastor – who brought to St. Stephen’s Renwick as architect and Brumidi as painter. His successor was the famous Fr. Edward McGlynn who, while continuing the development of the architecture and decoration of his church, attained national notice with his impassioned – if sometimes eccentric – support of the workingman. And his successor was Fr. Charles Colton, who hailed from the parish but was much more of an establishment figure (he became chancellor of the Archdiocese of New York and then Bishop of Buffalo). 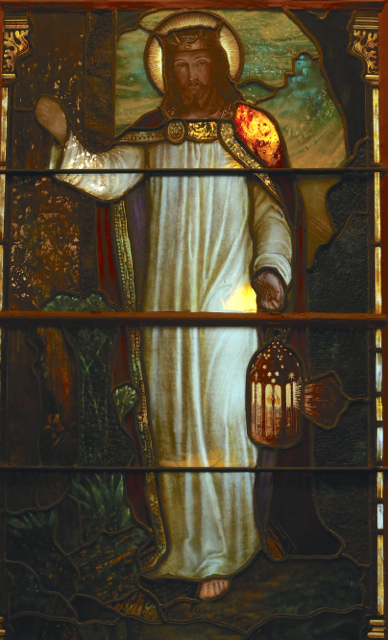 Colton built the magnificent parochial school building (he also founded the school itself – now part of the Epiphany school), paid off the parish debt and is responsible for much of the decoration in stained glass and marble that adorns the interior of St. Stephen’s today. The lack of significant artifacts dating after 1918 testifies to the declining importance of this parish. True, under Cardinal Spellman a new rectory was built and in 1952 a restoration was carried out. But it was already reported then that major work had been necessary to return the church to its former glory. And the drab brown 28th Street exterior is an unfortunate legacy of that restoration. From there things continued downhill. 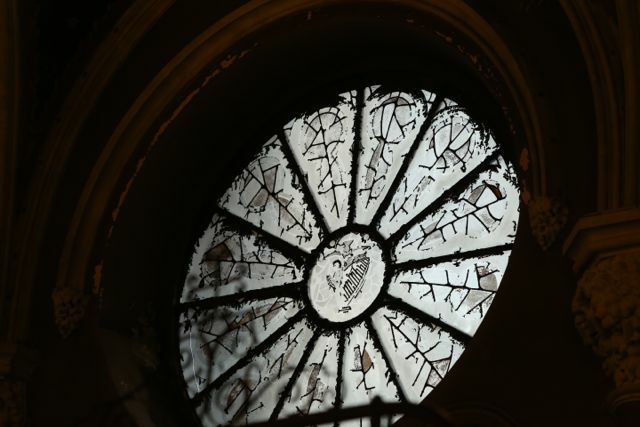 One sees it in the gray and white paint jobs that disfigure the interior walls of this church. In the 1980’s the nearby Carmelite church of Our Lady of the Scapular closed and that parish was merged with St. Stephen. 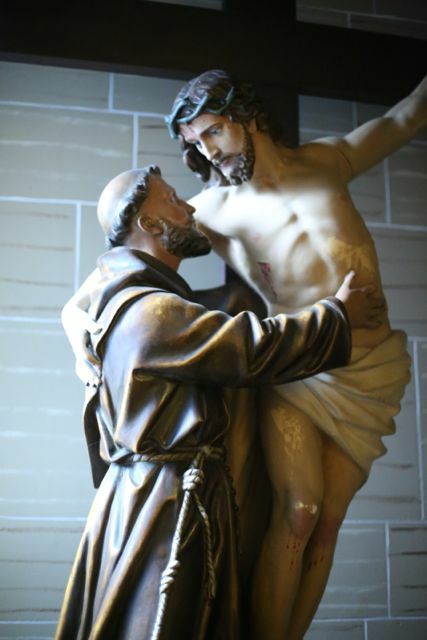 Indeed the combined parish was given to the care of the Carmelite friars. That was hardly a strengthening of the parish. 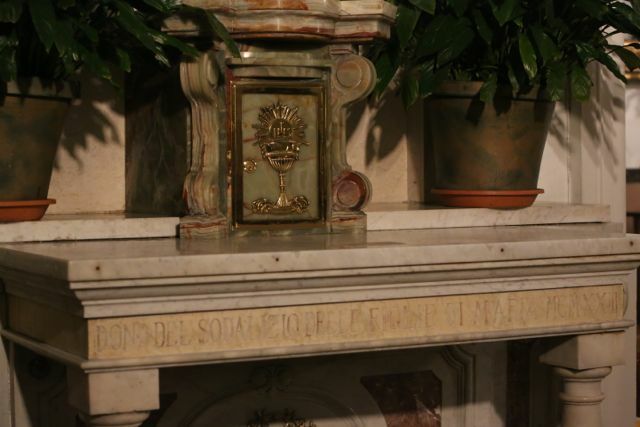 At some point an ugly altar was erected in the middle of the nave. 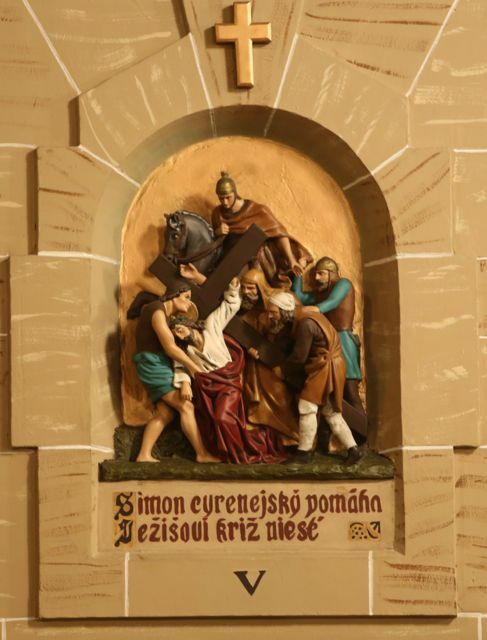 Some ten years ago the Carmelites were in turn unceremoniously dismissed from the parish. 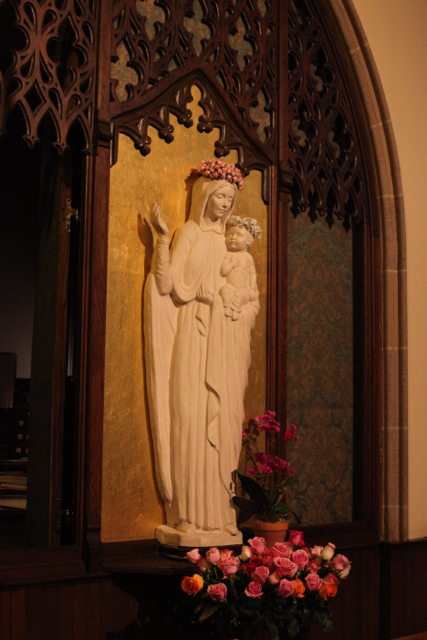 Then, in 2007, the nearby parish of the Sacred Hearts of Jesus and Mary was closed and reduced to a chapel. We wonder how much of the funds realized from the sale of most of that parish’s property came to St Stephen’s. And so the vicissitudes of St. Stephen’s continued. A partial restoration of the Brumidi murals a number of years ago involving the marketing of reproductions also did not help. 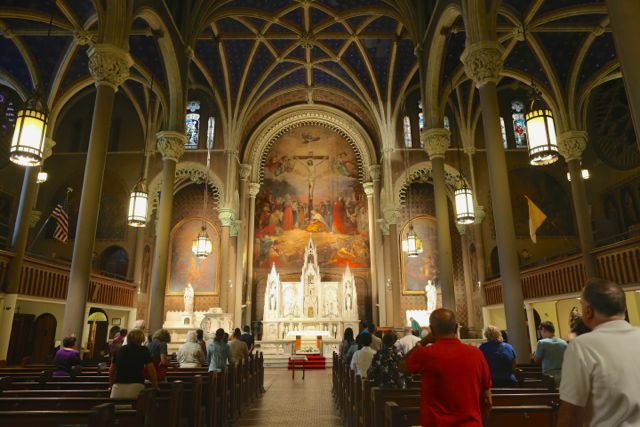 Need I mention that an obvious solution to revitalizing such old parishes (practiced in Chicago, for example, since the late 1980’s ) – entrusting them to one of the new traditionalist or conservative religious orders – still remains taboo in the New York Archdiocese. Let us skip forward to the current administrator, Fr. Robert J. Robbins, who seems destined to have the dubious distinction of being the last pastor of this church. I don’t think I need to tell readers of this blog that his short tenure as pastor of his other church – Our Saviour’s – has been controversial. But at St Stephen’s one must say that under his direction efforts had been made in the last two years to address some of the more egregious aesthetic problems. The nave altar – and associated junk – was removed. A new disposition of the lighting (if I am not mistaken) illuminates the altars and the main Brumidi mural of the sanctuary clearly for the first time in memory. But it is all too little, too late. 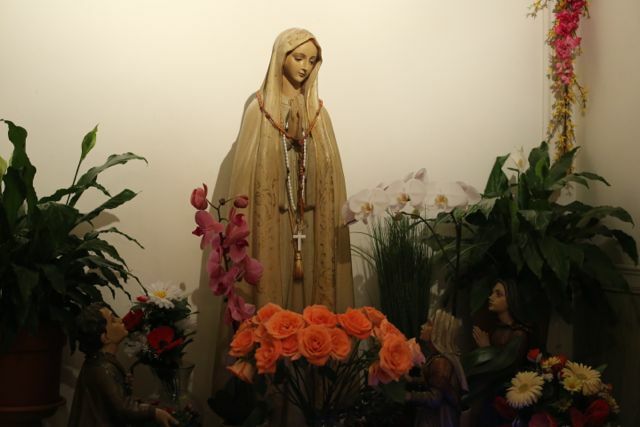 A visit to the recent Sunday 8:00 AM mass illustrated other problems – in addition to ongoing administrative confusion and bungled restorations – that have brought things to the current state. 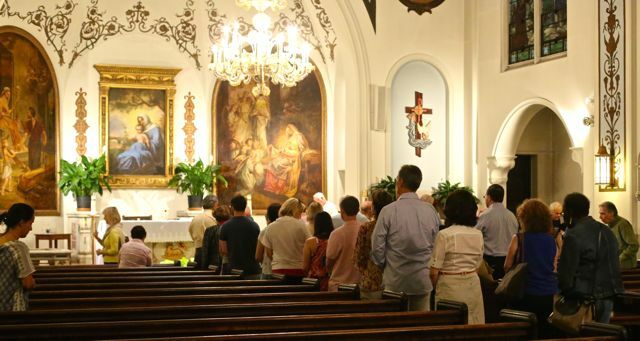 For this, the only mass on Sunday, hardly a hundred people were in attendance – most obviously not of the higher income brackets and with only two families among them. But this pathetic turnout was not just a cause of the parish closure but the effect of mistaken polices in force for years. Since the closing of the parish was announced the church has only been open for two hours a day for one 8:00 AM mass (including Sunday). And before that, St. Stephen’s recently has been closed entirely for weeks for “structural review” and in the summer as well. Before the “Making all Things New” days the situation was hardly better; the church was open for only a few more hours in the day (until 12:45PM or so). It’s no wonder attendance dwindled. This Sunday mass was also indicative of decades-old liturgical problems. A monsignor(in residence at Our Saviour) was assisted by a female lector and one man (an acolyte?). 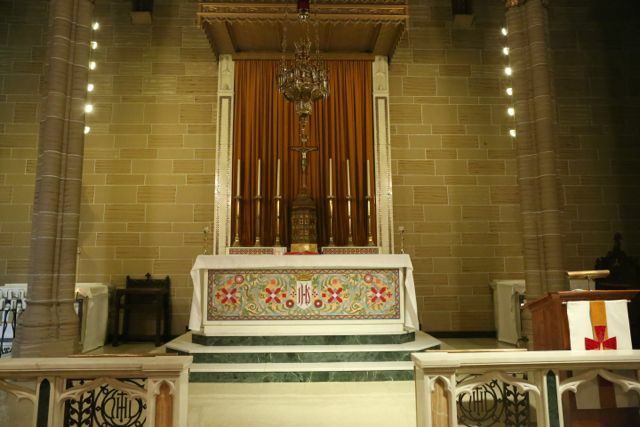 The Novus Ordo mass was celebrated as it is daily in hundreds of other archdiocesan churches – in a summary and casual manner with a complete absence of ceremony. 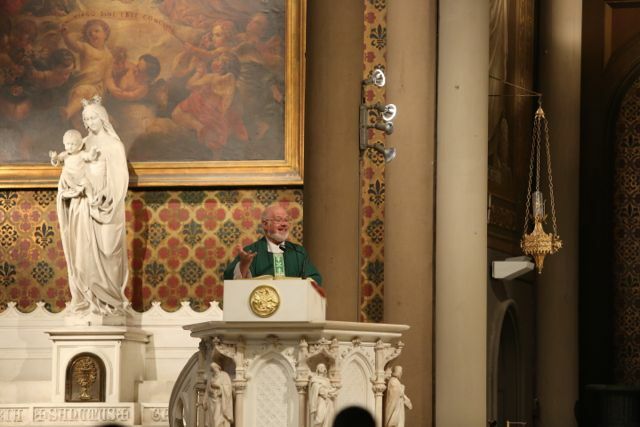 The left-of–center homily – the celebrant: “I will probably offend everyone here” – was lively – if you disregarded the fact that monsignor left the sanctuary to work the pews (they still do that?). 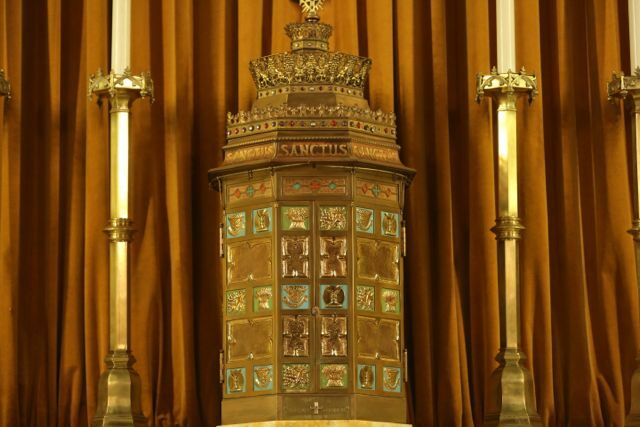 Later, monsignor first elevated the host and chalice and, when so raised, consecrated them – but I longer know what in the Novus Ordo is liturgical abuse or an accepted departure from the norm. My conclusion would be that the level of liturgical celebration at St Stephen’s in recent years – of which this service was representative – would not be an attraction to outsiders. Towards the end of this statement she burst into tears – or was it laughter? Monsignor finally hoped some of those present would make the move to Our Saviour – “even though it’s an uphill walk.” At least this priest realizes that many of the parishioners in New York City (and in some other parts of the Archdiocese as well, like Port Chester) walked to their church. The walk from Our Savior to St Stephen’s, for example, is a good 15 minutes – assuming you are not elderly or have no health issues. This is a significant burden on many people – one that doesn’t seem to have occurred to the Archdiocesan planners. Monsignor closed by wishing once again that people would come over to Our Savior for “we’re not as bad as we appear to be.” After the mass, a handful of parishioners recited the rosary. At 9:00 AM a female “janitor” brusquely announced, “I’m closing.” That was it – the two hours were up. And in way it was an epitaph for this grand historic church. 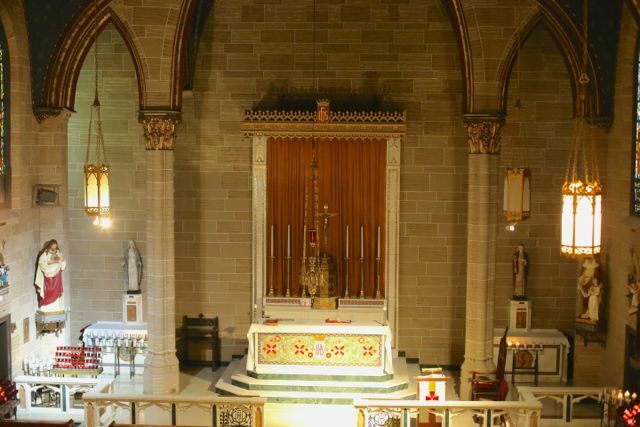 (Above) The interior of St Stephen’s was much improved just in the last year and a half by the removal of a central altar and assorted junk that had been inserted in the transept. (Above)) The view facing the rear. (Below)The price of these improvements was the walling off of the pew area by a crude barrier and the removal of the pews between the barrier and the entrance. In effect, a much smaller church was created; it goes without saying that the transept galleries also have been unused for ages. (Above) The casual celebration of the new mass amid the solemn trappings of the past. 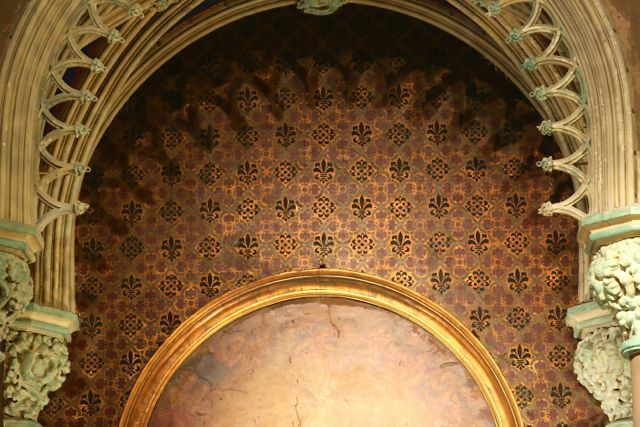 (Above and below) Churches have recently spent fortunes recreating this kind of Victorian-era stenciling. (Above and below) The paintings that cover so much of this church are from an earlier era that most of the stained glass and furnishings. The artist was Constantino Brumidi (with many assistants). (above) This mural above the entrance seems to show damage that has arisen just in the last few years. 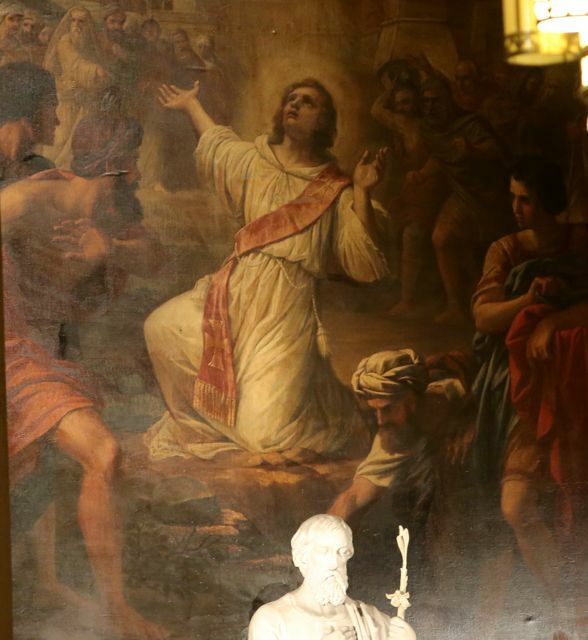 (Above) This painting of St. Stephen by Brumidi was the original high altar of this church before the great expansion of 1865-66. Although darkened and difficult to see, it shows greater sensitivity and a more explicitly baroque inspiration than most of the artist’s later grandiose murals. 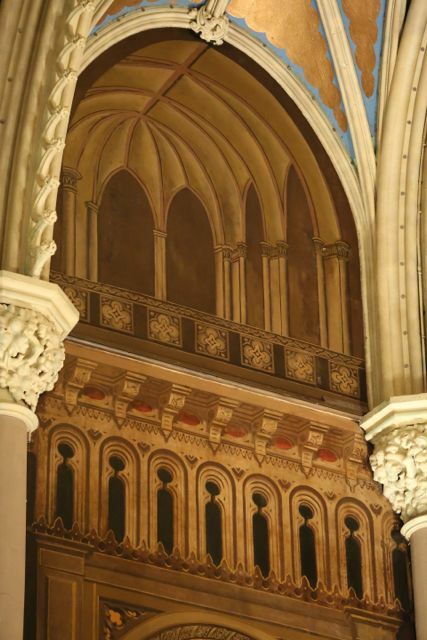 (Above) A trompe l’oeil effect creating a “transept” to the side of the main altar. 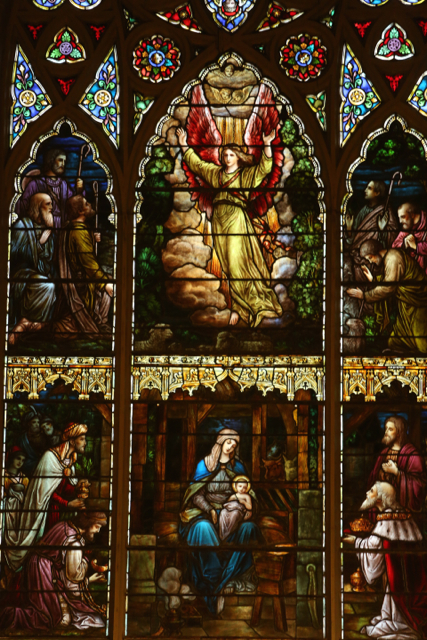 (Above) St Stephen’s has perhaps the most extensive stained glass of any Catholic church in New York aside from St. Patrick’s cathedral and St Vincent Ferrer. 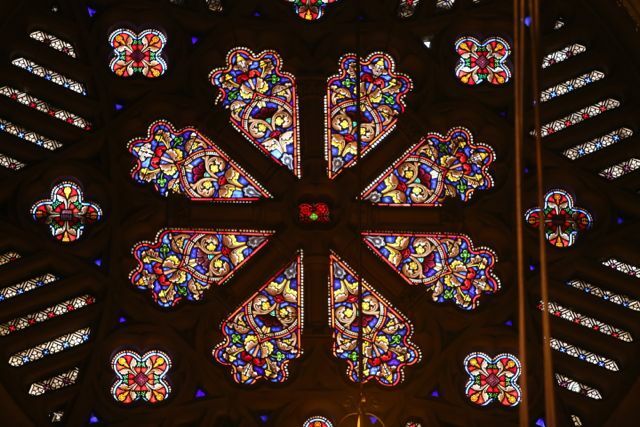 The above rose window may be roughly contemporary with the architecture. Most of the windows, however, are German and date to the 1890’s onward. 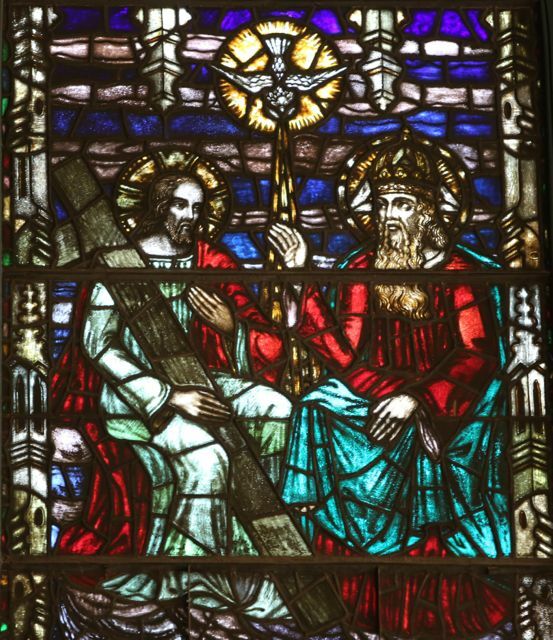 (above) The amount of window space in St. Stephen’s was so vast that some early windows were never replaced with more modern glass. 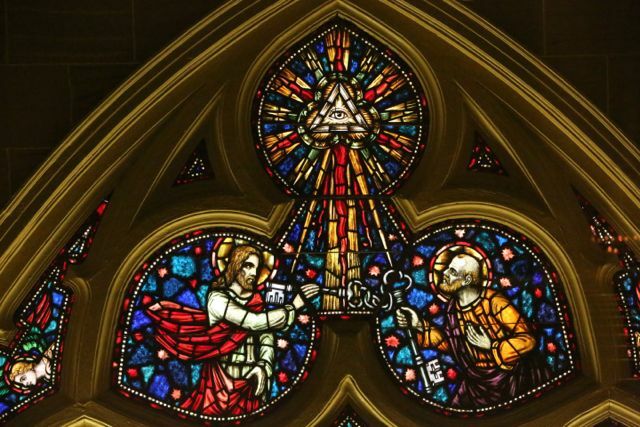 This curious window shows the ghost of an Irish harp in the centre. Its original paint seems to have washed away. 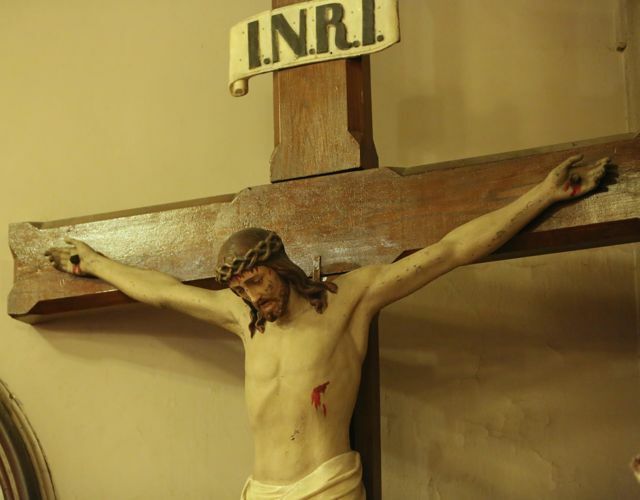 (Above) As is so often the case in old New York churches, a large crucifix is found near the entrance. 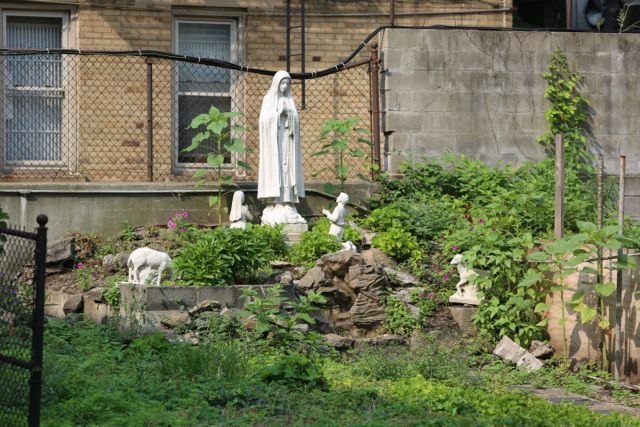 (Above) Near the church is this Fatima shrine – still tended by someone but gradually being overwhelmed by weeds. Pope Francis visiting Our Lady Queen of Angels School…. But what about the East Harlem parish that Cardinal Egan closed in 2007 – against the continuing resistance of the congregation? 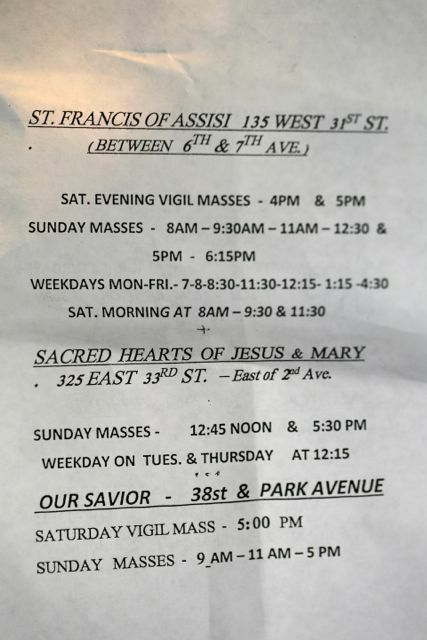 And East Harlem has been hit hard by more recent waves of church and school closings: Holy Rosary, St. Lucy, Holy Agony…. “Our Lady of Revenue”: a full report (video and text) from USAToday on “Making all Things New” and the booming Manhattan real estate market. 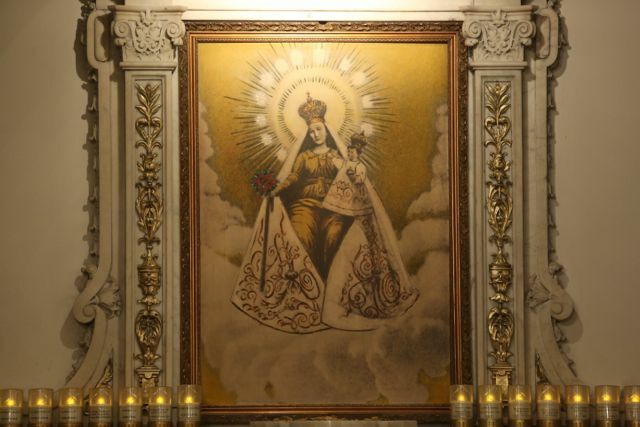 With the spotlight on the parishes of Our Lady of Vilna, Our Lady of Peace and St. Thomas More. (This blog has already reported on all three churches). 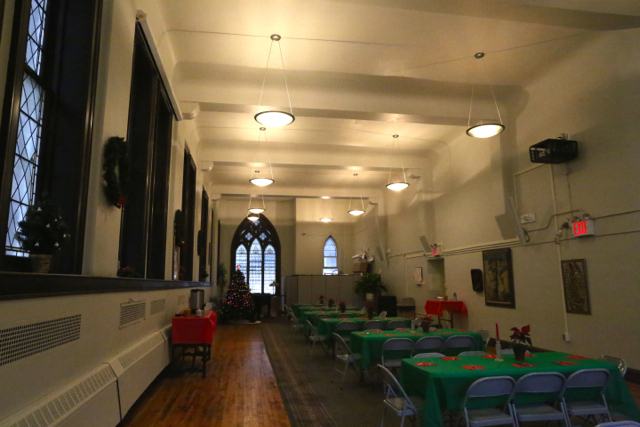 Another small Manhattan church – well attended, financially self-sustaining and in an upscale area – nevertheless scheduled for closing. 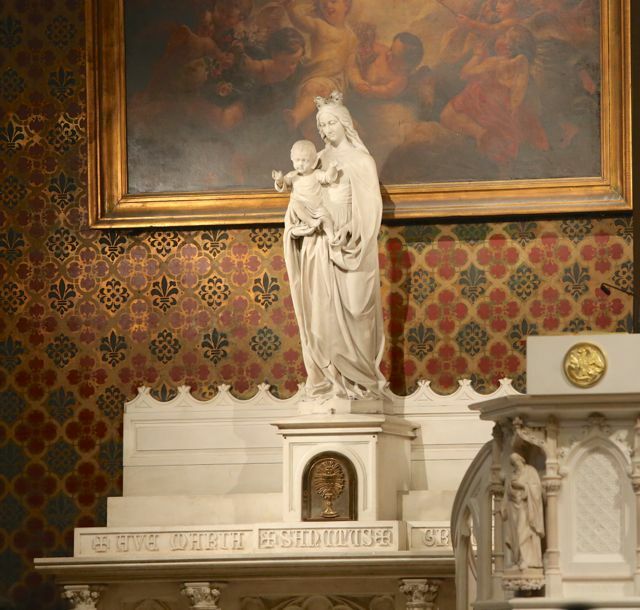 It’s “beautiful” too, and part of a historic district – but the following article from the New York Times makes clear that “aesthetics” counts for little in the present-day Roman Catholic Church. 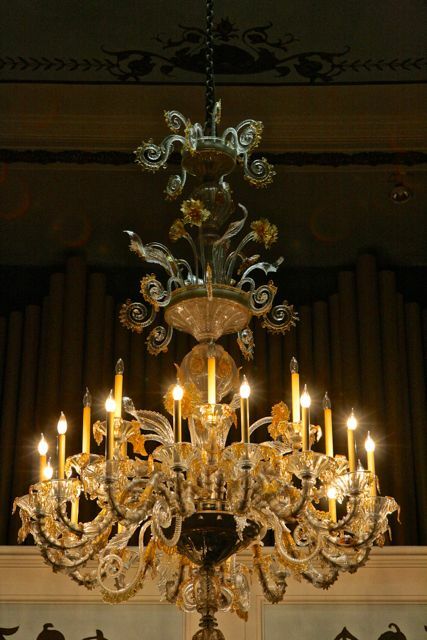 One of the Venetian chandeliers. 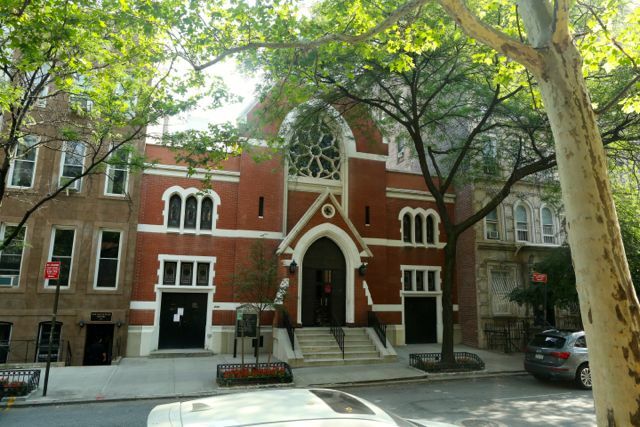 For your convenience listed below are links to our posts on the Manhattan churches that (currently) will be essentially closed under the “Making all Things New” program. Note that there are other churches that will be eliminated outside of the formal reorganization plan. It’s an elegant area indeed around East 90th Street near Park, the so-called “Carnegie Hill.” Even up to the early 1980’s it had the reputation of being a lesser known, less socially prominent but quieter alternative to the Upper East Side to the immediate south. But those days are long past and both areas are for all intents and purposes indistinguishable. Yet overshadowed by the cold luxury of the high rise apartment buildings we find a remarkable sight straight out of the English countryside: a small stone Gothic Church, in the midst of a rambling set of buildings and crowned by a curiously articulated, romantic tower. For good reason we always encounter the same adjectives in articles about this church: ”quaint,” “picturesque,” “quirky,” “charming.” Even if, nowadays, St. Thomas More is dwarfed by the monstrously scaled buildings that surround it and which condemn this delicate little sanctuary to partial perpetual shadow. There is much history here. 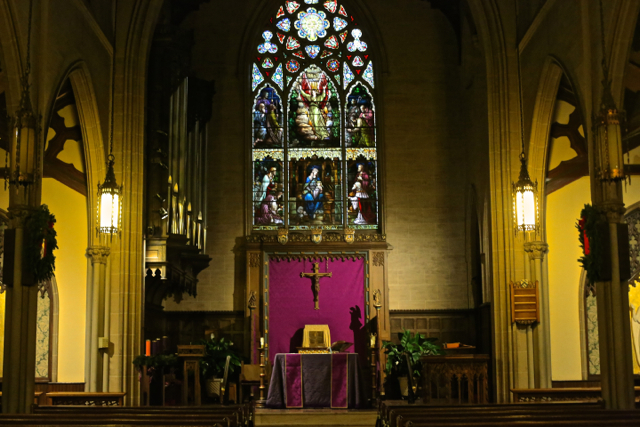 St. Thomas More is the second oldest church on the Upper East Side, yet it is also one of the most recent Catholic parishes on the island of Manhattan– for it was not even built as a Catholic church! 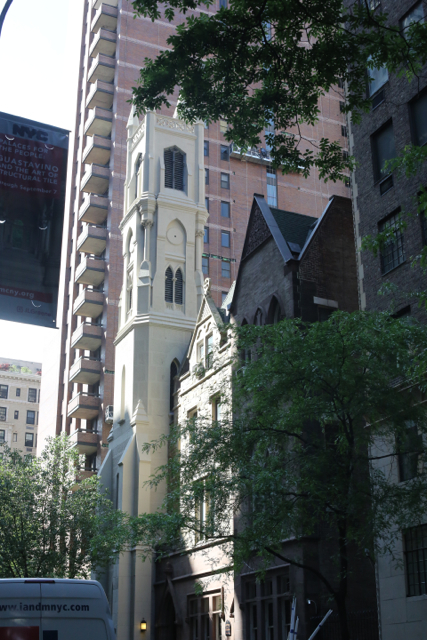 1) When this church was built in 1870 it stood isolated near the developing district of Yorkville, far to the north of the built up areas of New York City. 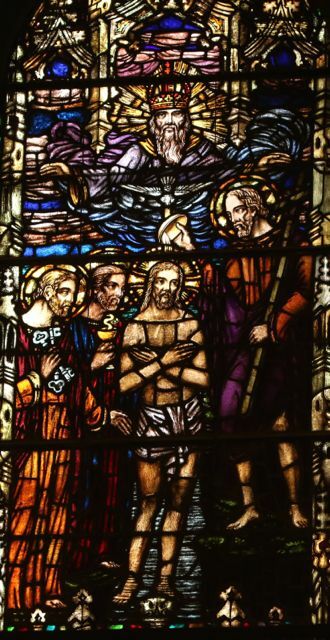 It was created by the Episcopal church as the Church of the Beloved Disciple for “St. 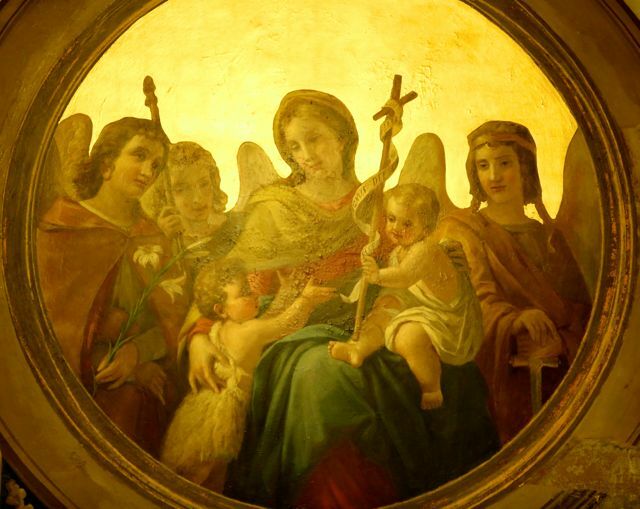 Luke’s Home for Indigent Women.” As time went on more structures were added: a chapel to the west, a rectory and a parish house to the east, giving the church its present romantic appearance. 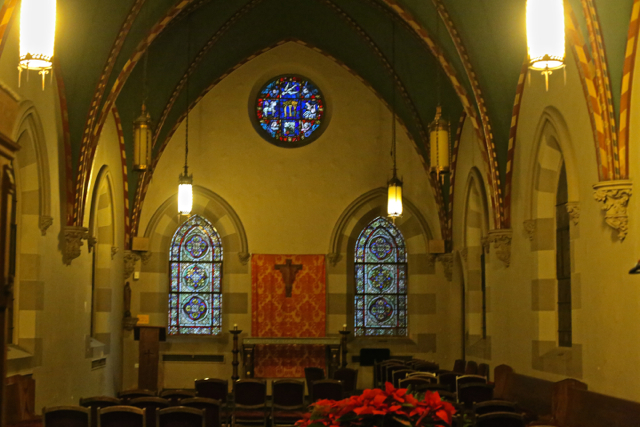 In 1950 Cardinal Spellman acquired this church for the new parish of St. Thomas More. I have heard entertaining tales as to why this was done – usually revolving around rivalry with the Jesuits of St. Ignatius Loyola parish. 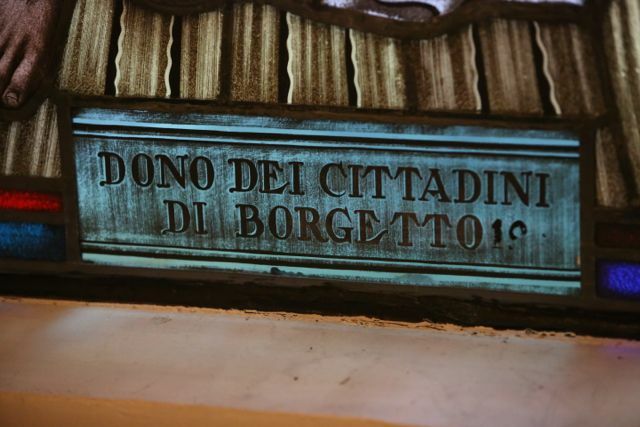 It is said that the proprietor of a funeral home had had a falling out with Jesuits of St. Ignatius Loyola parish. In revenge he instigated the creation of a new parish to which he could offer his services. 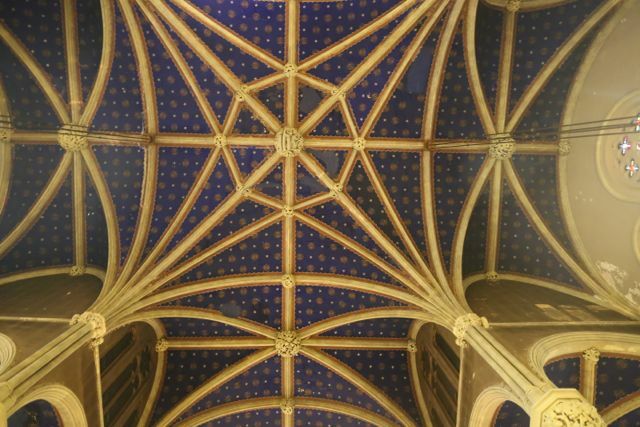 Or that Cardinal Spellman himself wanted to break the monopoly of the Jesuits to the Upper East Side (the wealthiest neighborhood of the country, even of the world). More likely, as in the case Our Saviour’s parish erected a few years later, Cardinal Spellman just wanted to give the residents of a well-heeled enclave a neighborhood church of their own. 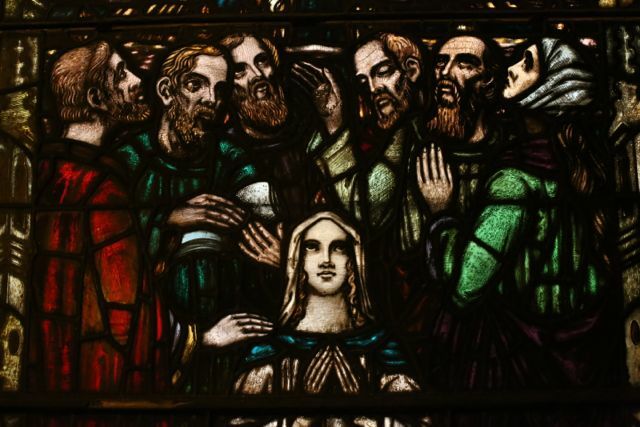 For it was an age where church policy favored the establishment of smaller, more accessible communities in place of the huge (both in terms of the size of the congregation and of the church) parishes of yore. (Below) The photograph exaggerates the size of church. Much of this decoration is still in place. It is all very 1950’s “liturgical movement,” very restrained and very elegant. The white statues of the side altars barely emerge from the wall – no exuberant army of painted images here! It is understandable that only one or two candles – even if real – are lit before such images. 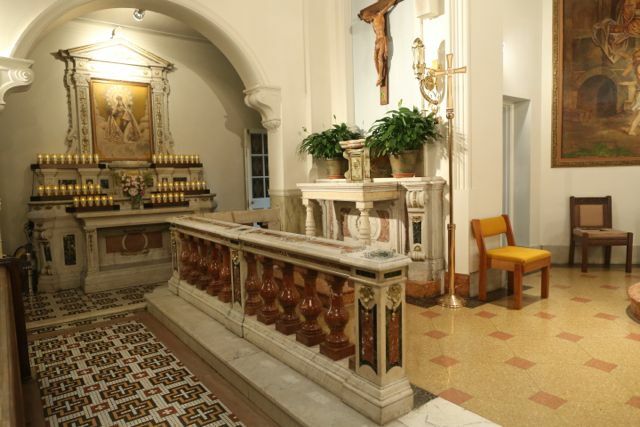 A severe post conciliar housecleaning removed, among other things, the communion rail. More recent restoration added a prominent organ in the sanctuary. The overall appearance of the sanctuary today would not offend the sensitivities of the prior Anglican and even Dutch Reformed proprietors of this place. 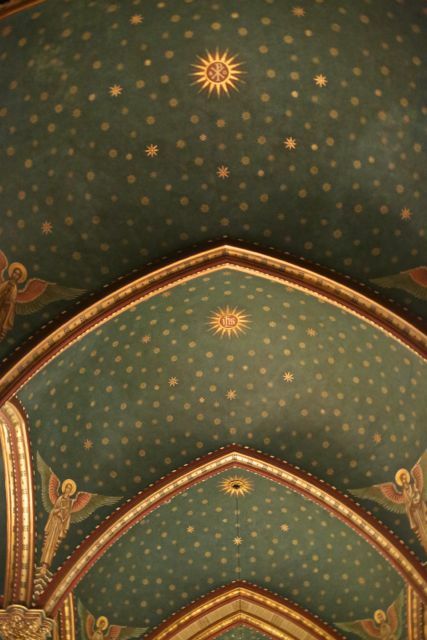 Nevertheless this small church is a place of contemplation and beauty – entirely attributable to the former Protestant congregations who left a legacy of architecture and stained glass – in the Catholic Style, as Pugin would have said – to the parish. 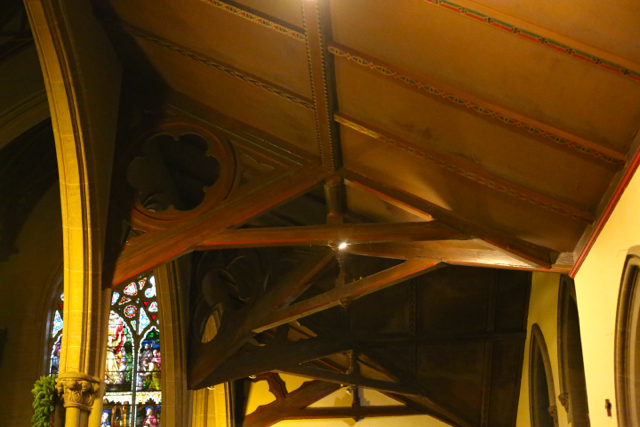 The Gothic arches of the aisles support a wooden hammer beam ceiling. 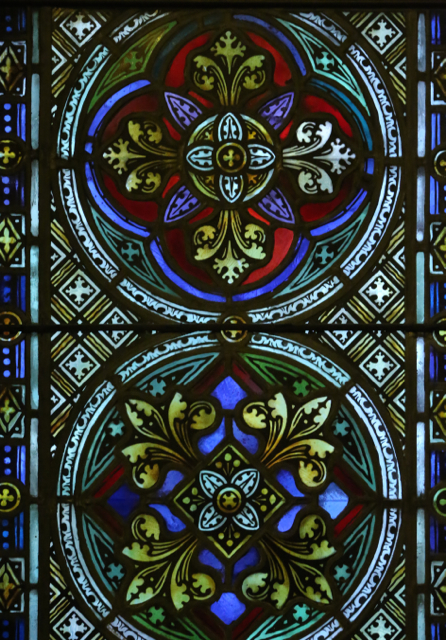 When the lights are dimmed the bright colors of the stained glass glow in the obscurity. 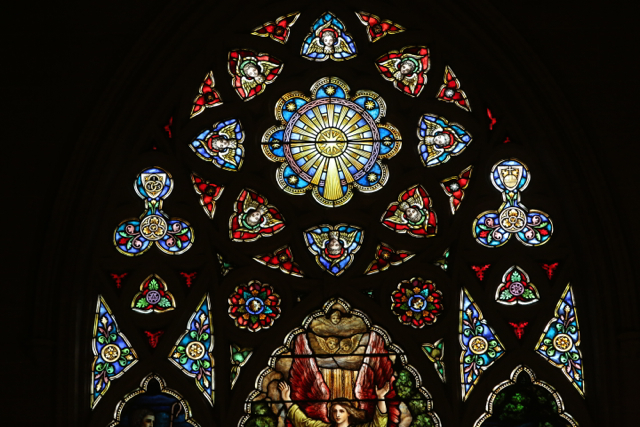 These windows constitute the most prominent decorative element of the church. 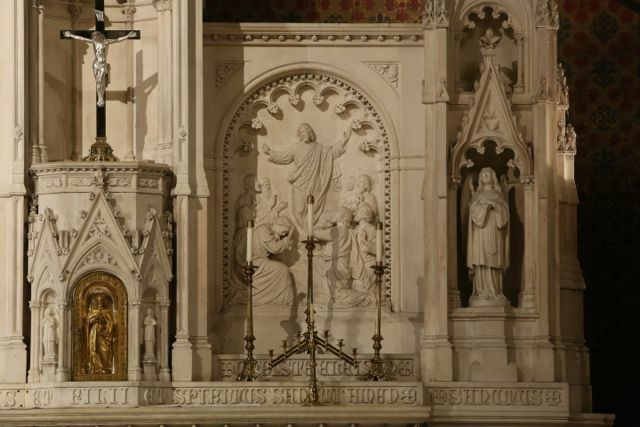 At least the wood of Cardinal Spellman’s reredos does not dispel these impressions. 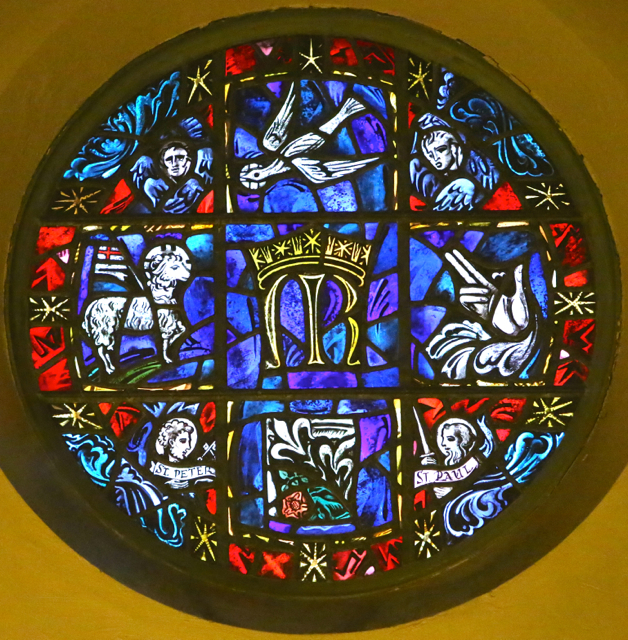 (Above and below) The “Protestant” Windows. The Church of St. Thomas More, both in its interior and exterior, demonstrates how, despite a restricted scale, good architecture can make a profound impression. 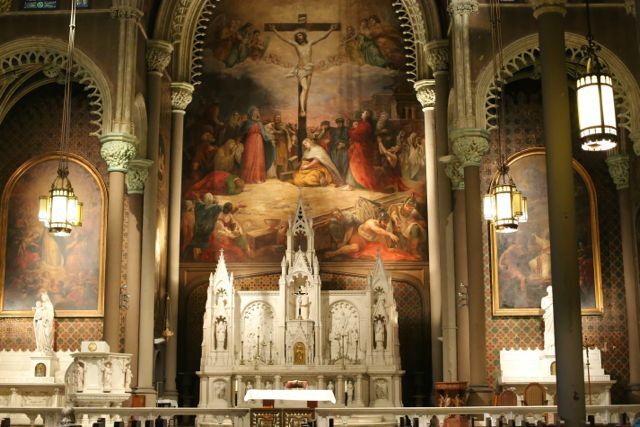 It is a testimony to the declining state of the arts in the Catholic church of the mid- twentieth century, though, that Cardinal Spellman’s two most successful churches in Manhattan – St. Thomas More and Immaculate Conception – were 19th century structures created by Episcopalians. 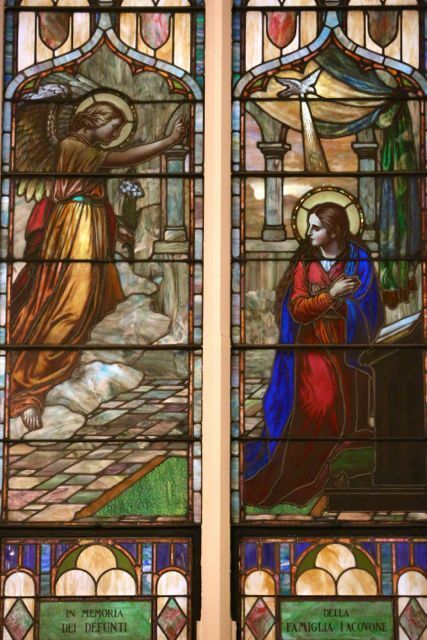 (Above) The “Foley” chapel – which at one point was considered a “Lady Chapel.” (Below) After the chapel became Catholic, a window with the coat of arms of the Dutch Reformed church was replced by this window which includes Marian symbols. 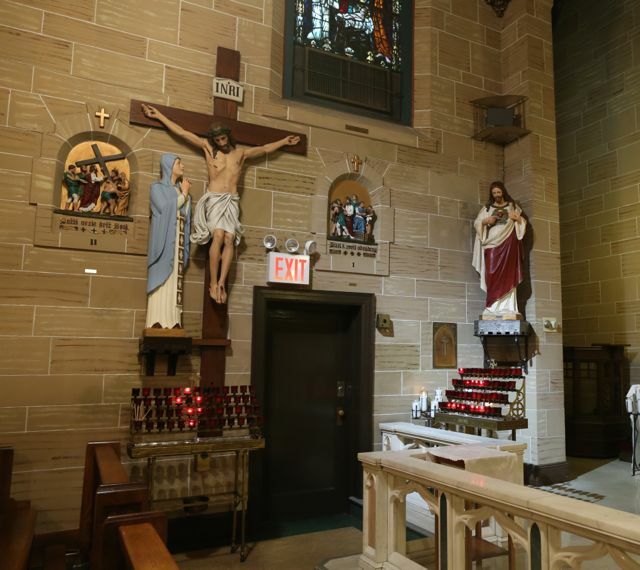 After its establishment, St. Thomas More parish quietly carried on in its corner of Manhattan. In the early 80’s it was the scene of some surprising and original lay initiatives. The prior management of the parish were among the few clergy of the day who saw the need to reach out to the “young professionals” (at that time there was a more disparaging term in circulation) of the city. The result was a successful series of social events and Catholic devotions aimed at this population. 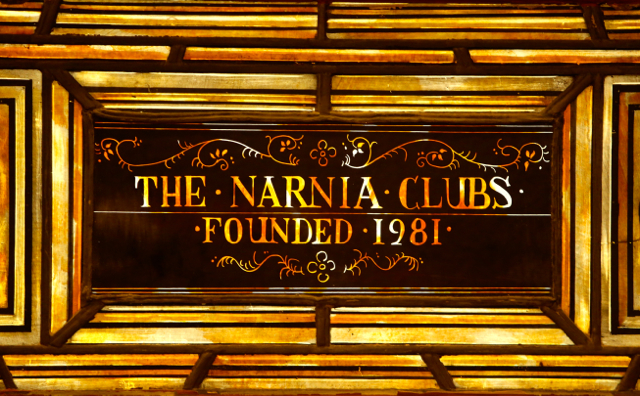 Similarly, 1981 saw the start of the Narnia club, which even today runs an orthodox catechetical program for the students of non-Catholic schools. So, despite its small scale, St. Thomas More parish seemingly could do little wrong. It was affluent, active and “vibrant.” It was and is in the black. A nursery school was established on the premises of the parish. 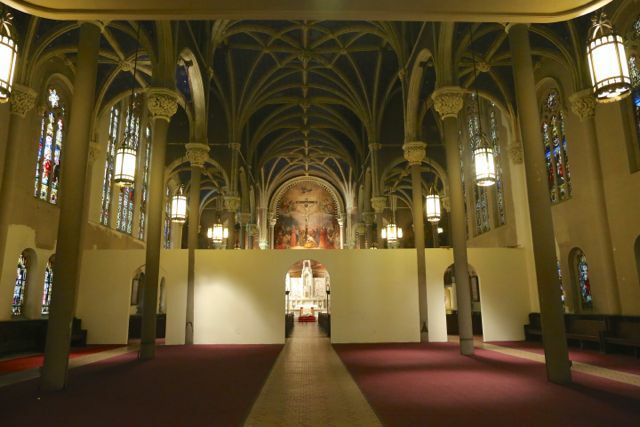 St. Thomas More parish had carried out a multi-year restoration of the exterior and interior. 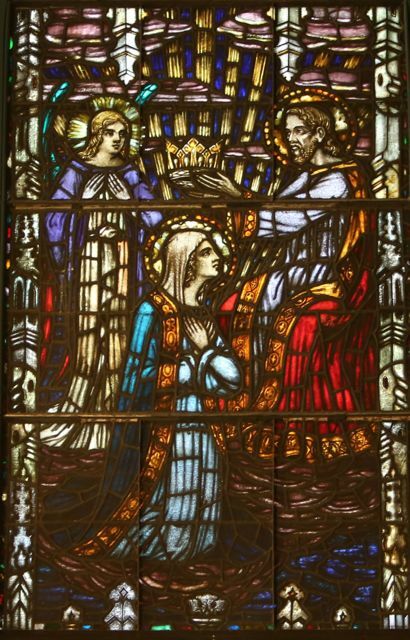 That included the restoration of the stained glass. In what seemed at least to me to be a controversial choice, the dedications of the original Protestant donors were knocked out and the names of the new donors to the restoration campaign substituted. As we shall see, however, their glory may be short-lived. 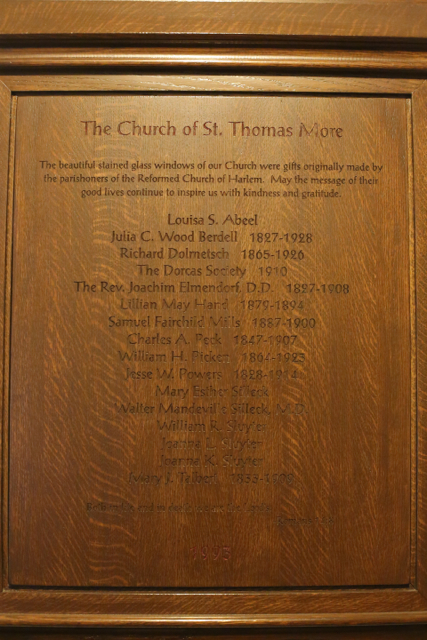 (Above) If you are curious there is a plaque in the small “narthex” listing the original benefactors of the windows. 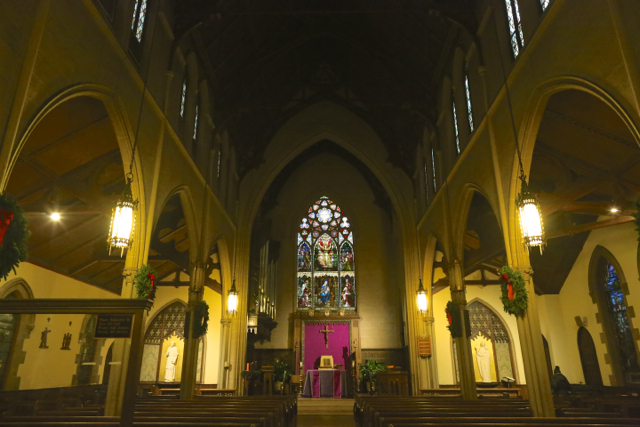 Yes, at least as far as the churches of Manhattan island are concerned, St. Thomas More appeared to be the ideal Archdiocesan parish. It is characteristic that the o-so-very-progressive court historian of the Archdiocese, (Fr.) 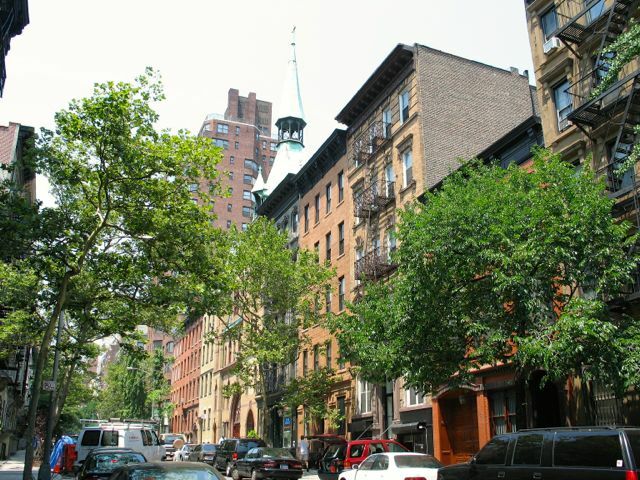 Thomas J. Shelley, who wrote effusively about labor unions, class conflict and the civil rights movement, chose to reside for years not at parishes such as Holy Agony, St. Teresa or All Saints (to name three options just in Manhattan), but here. So St. Thomas More parish now is in the first – and perhaps last – great crisis of its 64-year existence. 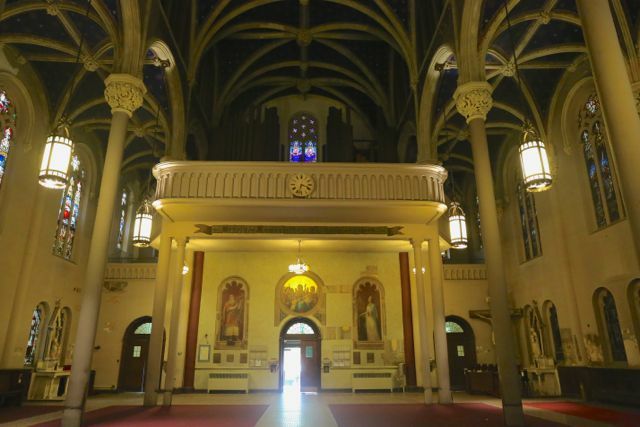 What a tragedy for the parishioners, the neighborhood and the city as whole to lose such a unique architectural landmark – and reverent place of prayer! Perhaps this is the lesson: even if one – a parish, a diocese or an individual Catholic – leads an economically sheltered life, even if one abides by all the ecclesiastical “rules of the game,” the worsening crisis of the Roman Catholic Church will inevitably overtake him. 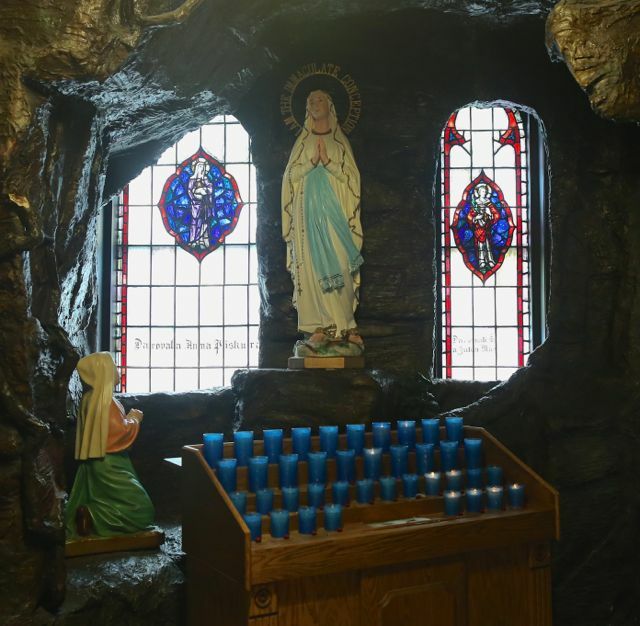 I wish this parish, which I have known for so many years, well in its campaign for survival. An affluent parish like this does have some powerful and articulate allies. 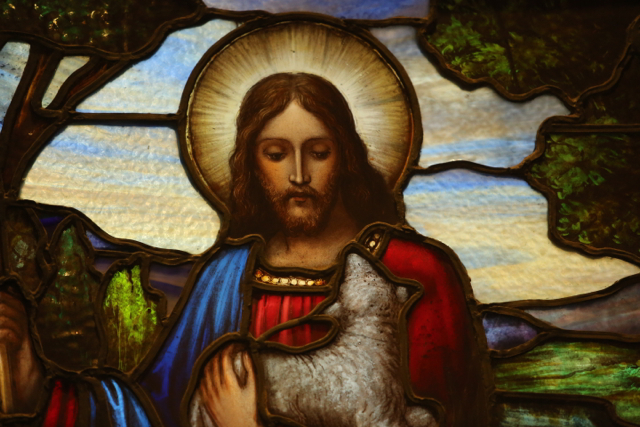 Yet I would also encourage them to reflect on the life of their patron saint – who, after all, also lived – and was martyred – in a time of conflict, confusion and chaos within the Church. See the informative parish WEBSITE for materials on the proposed closure and on the parish, online petitions etc.